Categories and Tags are something that allow us to bunch together certain posts covering similar topics. For example you can choose to have Google as a category and apply it to every post which might be covering something about Google. Tags also pretty much do the same thing as Categories. Main difference is we can have sub–categories while tags have no sub–tags. In Blogger.com we use Labels and similarly with WordPress we have Categories and Tags as explained in writing and editing a post on WordPress. Categories and Tags in WordPress play a vital role while writing posts. They are used for grouping of posts which are on similar topics. Categories and Tags can be created even while writing a new post. To look that up check out Writing and Editing a post on WordPress. 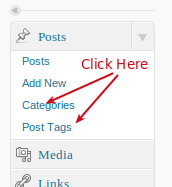 How to Create Categories on WordPress? Click on Categories menu as shown in above image. Now you should be at the Add New Category panel (image below) and now we can start to creating new categories. As you can see in the image below you can Name the Category and select a Parent for the category. Example: We have a category called “Gmail” and Select a parent category as “Google” it means the ‘Gmail’ is a sub-category of ‘Google’. 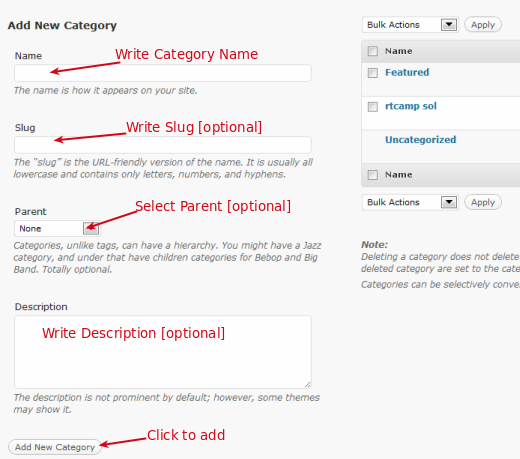 There are optional choices like writing a description for a Category and also for adding a name for slug. Note: WordPress default category (Uncategorized) cannot be deleted but can only be renamed! How to Create Tags on WordPress? For creating tags the process is same as creating categories. The only real difference is that a tag cannot be assigned as parent. Which means we do not have sub-tags like we can create sub-categories. 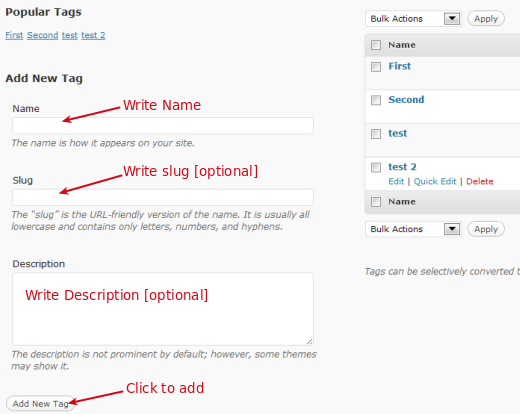 In WordPress there are usually many more Tags as compared to Categories. This is not a requirement and it is really up-to the end user. Now lets see a video on how to go about adding and deleting Categories on WordPress. Like we have Labels in Blogger.com we have Tags in WordPress. The functionality for Tags and Labels are pretty much the same. WordPress has additional features like Categories which can also has sub-categories.